The delicate inch-long bell-like wildflowers called wild oats are among the small gems found in our woods in the special time before the trees leaf out and block the sunlight from the forest floor. The low plants grow only 6-13 inches tall and have one blossom each. The time for treasure-hunting for early spring woodland wildflowers begins in mid-April, when one of the smallest and earliest gems among them appears in Westborough’s woods: a bell-like native wildflower with the odd name of wild oats. The treasure hunt begins now, while full sunlight still reaches the ground in the woods, where it will be rarely seen once the trees leaf out in May and block it. The earliest woodland wildflowers, known as “spring ephemerals,” bloom in this short, special time when sunlight makes the forest floor a very different environment than it will become several weeks from now. Note that the native wildflower called wild oats (Uvularia sessilifolia) is not the grass that’s the cereal grain (Avena sativa) that gives us our morning oatmeal. Nor is it one of the other Avena grasses that grow as weeds among cereal crops and are often known as “wild oats.” The expression “sowing wild oats” goes back at least to England of the 1500s and is related to the uselessness of these weeds. The spring wildflower, wild oats, is low plant only 6-13 inches high with a delicate, downward-facing bell-shaped blossom. The bell is about an inch long. Its creamy, straw color blends well with the dried leaves on the ground, making it hard to spot this little treasure. The flower’s color gives the plant another name, straw-lily. The nodding bells are not showy, but they do give off a faint scent, which bees are more likely to notice than we are. For bees that find the beautiful small bells, there’s a reward of nectar. The bees that are most likely to visit wild oats and other early spring wildflowers are bumblebees. That’s because the furry bumblebees are able to fly and forage at lower temperatures than honeybees and other types of bees, so they’re out pollinating on chilly mornings and afternoons and cool spring days. Their muscles work hard and produce heat, which the “fur” on their bodies traps. You may have noticed bumblebees flying in late March, even after cold weather arrived and finally put an end to the unseasonable warmth we’d been having. 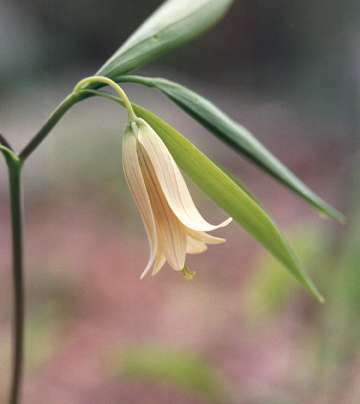 Wild oats plants grow in the acid soils of eastern Massachusetts, especially in moist, open woods. If you know a place where jack-in-the-pulpit usually blooms (in early June), look for wild oats in the vicinity. The wild oats plant is a perennial, so you’re likely to find it in the same places year after year. It grows from an underground stem, or rhizome, drawing on energy stored from last season to put out leaves and a flower so early in the spring. Wild oats is in the bellflower family. It was once counted in the lily family, but advances in modern genetics have provided new information about relationships among plants. Botanists have now re-defined the lily family more narrowly. In earlier times, people regarded wild oats and other bellflowers as a remedy for sore throats and mouth sores because the dangling bells reminded them of the fleshy lobe that hangs at the back of the human throat. (This lobe is called the uvula, and the resemblance gave bellflowers part of their scientific name, Uvularia.) The old European “doctrine of signatures” held that the appearance of plants provides clues about the body parts they might be used to treat. Native Americans had a different set of medicinal uses for this native plant. They made tea from the root or rhizome as a treatment for diarrhea, as well as a medicine to encourage broken bones to heal. They also used it externally in warm, moist wraps for boils and broken bones, and made a lotion from it for use in massaging sore muscles. The shoots of wild oats are considered edible if boiled like asparagus (after removing any leafy tips), but the plants usually aren’t abundant, so it’s best not to harvest them. These flowers are a joy to discover, and they require no gardening (unless you want to grow wildflowers in your garden). All we have to do is care for and preserve the greater garden of the natural world around us. Happy spring!